Day 17: A piece of glass is required to meet today’s assignment, with the idea of incorporating it into the photos in an interesting way. 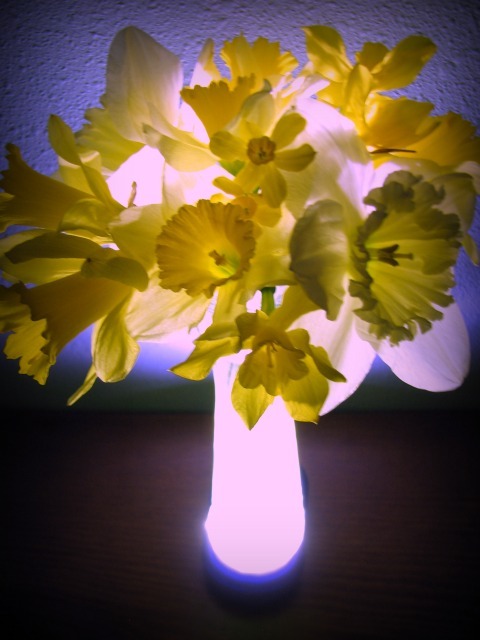 This glass vase full of several types of daffodils from our yard looks interesting when up lit by a very bright LED flashlight. The Photo 101 assignment mentioned trying photos with and without the flash. 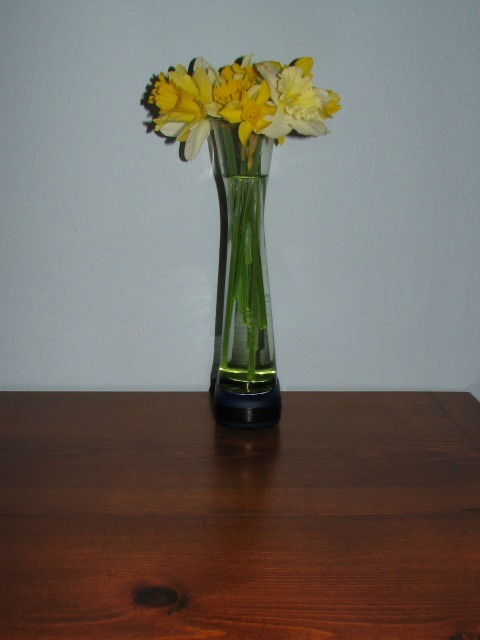 Pretty daffodils, but the photo is not nearly as unique when I use the flash. I can hardly see that the flashlight is on in this photo. Using PicMonkey editing tools, I adjusted the color temperature more cool (blue) and added dark edges to this photo. Flowers are blooming, trees are budding, sparrows are settling into our new birdhouses, and robins are staking out territories in the yard. Aaahhh…I enjoy spring! Don’t you? Spring is wonderful, it is lovely when the garden comes alive 😄 I really like the lighting in the first shot it adds an element of intrigue. Thanks! I was going to list more detail about the setting I used on my camera, but I used so many I lost track! Some settings gave much more interesting effects than others with the lighting. The “Auto” setting made the photo look almost like it was a negative with dull colors. I discovered that my camera not only has the “snow” setting I used before, but it has “fireworks,” “beach,” “foliage,” and others. It was one of those that I used to get the effect in the first photo. Lovin your creativity…the first capture is amazing! Thank you! As I was saying to the previous person who commented, I was trying out different camera settings for the first photo and got surprisingly different results. I can’t remember which setting I used on that particular photo (I think it was either “Aperture Priority” or “Night Scene.”), but other photos were not nearly as nice as this one. 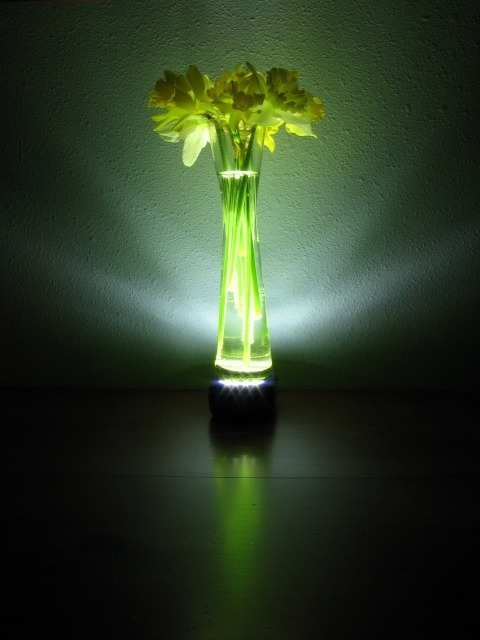 I liked the way the flashlight made a row of sparkles under the vase in this photo — only two camera settings captured that effect. ….all part of explore, experiment and enjoying photography…? Your lighting is spectacular. Nice job. Thank you. The flashlight is just a $4 plastic LED thing from a tool store. I was unimpressed with it when I tried to use it recently to shoot close up photos of my friends’ eyes. My daughter put in new batteries, and now you can nearly blind someone with it from across the room! When the Photo 101 assignment mentioned the effects of light and reflection on glass, I immediately thought of using that flashlight! Really like the photos using the light. Makes everything more beautiful. Ah Spring, love it.